Crock Pot Strawberry Vanilla Spoon Cake - Recipes That Crock! If you love strawberry cake, you don’t want to miss this Crock Pot Strawberry Vanilla Spoon Cake! It is a snap to make and so delicious! When I made this delicious Crock Pot Vanilla Sour Cream Cake from Gooseberry Patch’s Slow Cooker Fall Favorites, Mary suggested using a strawberry cake mix to us on Facebook. I LOVED this idea and wanted to give it a try! I tried this recipe a couple different times before I got it right. On my first try, I used Cassie (my 9 x13 casserole slow cooker made by Crock Pot) and tried doing a cream cheese swirl. It didn’t set up well. The edges were overdone while the middle wasn’t done. So, I went back to the drawing board. I changed the recipe a bit and made a cream cheese icing instead of a cream cheese swirl…and voilà! 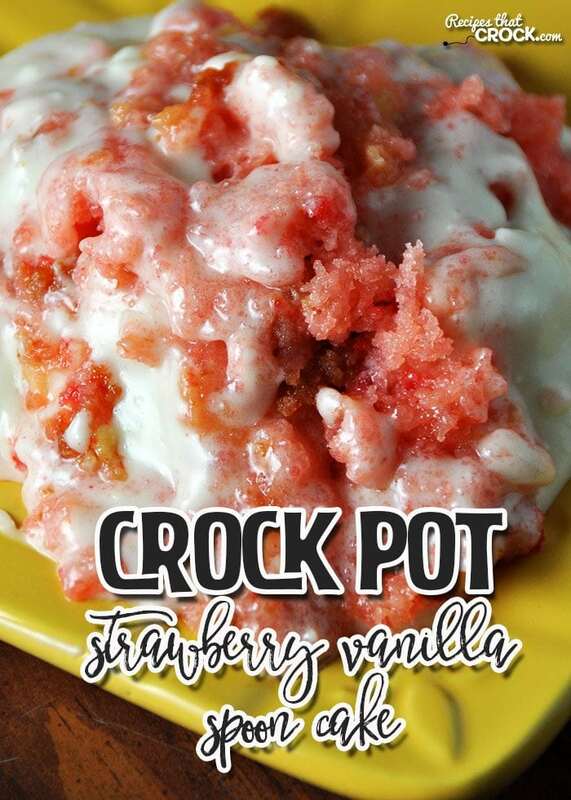 You have this deliciously rich Crock Pot Strawberry Vanilla Spoon Cake! Instead of sour cream in this cake, I gave Greek yogurt a try. It worked perfectly. However, if you have sour cream on hand, but not Greek yogurt, you can substitute your sour cream. I haven’t tried sour cream with this Crock pot Strawberry Vanilla Spoon Cake, but it worked really well with my Crock Pot Vanilla Sour Cream Cake (which is what this recipe is based on). I ended up using Sir Hamilton (my Hamilton Beach Programmable Insulated Slow Cooker) for this recipe, and he did an awesome job. 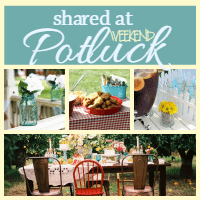 You can use your favorite 6-quart crock pot if you don’t have your own Sir Hamilton yet. You may need to turn your insert if one side of your crock cooks hotter than the other (kinda like when you turn your cake pan in your oven). I tried this recipe a couple different times before I got it right. On my first try, I used Cassie (my 9 x13 casserole slow cooker made by Crock Pot) and tried doing a cream cheese swirl. It didn't set up well. The edges were overdone while the middle wasn't done. So, I went back to the drawing board. I changed the recipe a bit and made a cream cheese icing instead of a cream cheese swirl...and voilà! 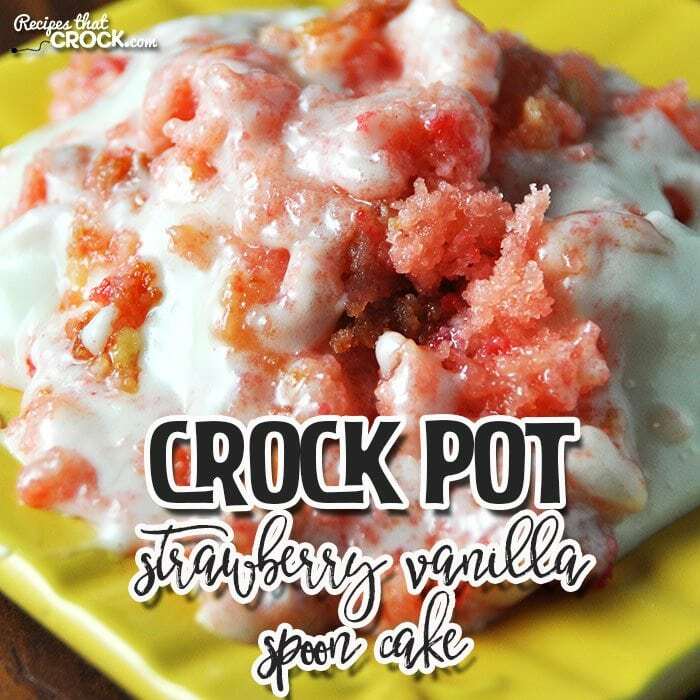 You have this deliciously rich Crock Pot Strawberry Vanilla Spoon Cake! Instead of sour cream in this cake, I gave Greek yogurt a try. It worked perfectly. However, if you have sour cream on hand, but not Greek yogurt, you can substitute your sour cream. I haven't tried sour cream with this Crock pot Strawberry Vanilla Spoon Cake, but it worked really well with my Crock Pot Vanilla Sour Cream Cake (which is what this recipe is based on). I ended up using Sir Hamilton (my Hamilton Beach Programmable Insulated Slow Cooker) for this recipe, and he did an awesome job. You can use your favorite 6-quart crock pot if you don't have your own Sir Hamilton yet. You may need to turn your insert if one side of your crock cooks hotter than the other (kinda like when you turn your cake pan in your oven).